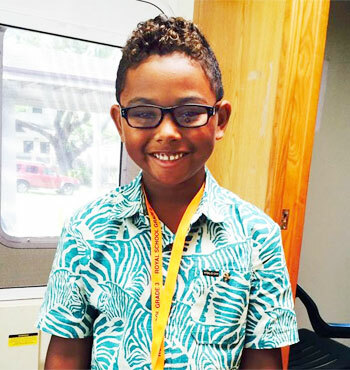 36 students at Kalihi Waena Elementary School will receive free glasses. Vision To Learn will provide free eye exams and glasses to over 500 Oahu school children. Hawaii State DOE and Project Vision Hawaii are partners in the project. Austin Beutner, Vision To Learn Founder and Chairman, will be joined by Governor David Ige at Kalihi Waena Elementary School to kick off Vision To Learn’s Oahu program. Representatives of project partners Hawaii State DOE and Project Vision Hawaii, and sponsoring foundations First Hawaiian Bank Foundation and Hawaii Pizza Hut Literacy Fund will also be on hand for the event. Governor Ige and Austin Beutner will be joined by 36 Kalihi Waena Elementary School students who are receiving eyeglasses, free of charge, from Vision To Learn. Additionally, Austin Beutner and the Vision To Learn staff will lead a tour of the Vision To Learn/Project Vision Hawaii mobile vision clinic. Vision To Learn was created by the Beutner Family Foundation in 2012 to provide free eye exams and free glasses to kids in low-income communities and has helped nearly 40,000 kids since its inception. As many as 15,000 public school children in Hawaii lack the glasses they need to see the board, read a book, study math and participate in class. To provide access to vision care to all elementary school students in need nationwide. 80% of all learning during a child’s first 12 years is through vision and 95% of 1st graders in California who need glasses do not have them. Vision To Learn solves this problem by bringing eye care to kids at schools and youth organizations. Nearly every day, Vision To Learn’s trained eye care professionals take the Mobile Eye Clinics directly to schools and community organizations in low-income communities to provide free eye exams and free glasses to kids. Since its inception in 2012, Vision To Learn has helped kids in over 30 districts in California and Delaware, had doctors examine nearly 40,000 students, provided almost 30,000 children with free glasses and referred thousands of kids with indications of serious eye or health problems such as amblyopia, diabetes, or motor skills deficiencies caused by vision impairment to medical experts. Since inception, Vision To Learn has provided services to kids at over 1,500 schools and community organizations.